The Illinois Premise Alert Program (Public Act 96-0788) allows people with special needs to provide information to police, fire, and EMS personnel to be stored in a database for use in an emergency situation. The information can then be provided to responders dealing with situations involving the special needs individuals. The information provided will be kept confidential and used only to provide police, fire, and EMS personnel with the information needed to deal with situations or emergencies involving a special needs person. The information will expire two (2) years after the date it was submitted and will no longer be maintained in the database. You may update or renew it at any time by completing and submitting the form below. 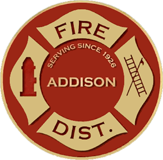 Individuals must understand that the information provided to the Premise Alert Program will not result in any type of preferential treatment to the individual and that the Addison Fire Protection District will not be held liable for duties relating to the reporting of special needs individuals. “Disability” means an individual’s physical or mental impairment substantially limits one or more of the major life activities; a record of such impairment; or when the individual is regarded as having such an impairment. To participate, you need to pickup or download (below) a Premise Alert Form. Fill out the form and return it in person to our headquarters station at 10 South Addison Road. Once properly filled out, the information will be entered into our dispatch center dtatbase for use during any further responses to that particular address. The Premise Alert Form may be filled out by the individual, a family member, a friend, care givers or medical personnel familiar with the individual. As a reminder, Premise Alert Forms need to be updated every 2 years.